The Holy Land Experience, Martin Dockery, Brooklyn, NY. Orange venue, 60 minutes, $10. If you were new to New York solo performer Martin Dockery, and you just happened on the first couple of sections of his new show The Holy Land Experience, you might be excused for thinking you were in for another “let’s stick it to Orlando” show. After all, some of the setup for Dockery’s solo show, his third in three years at Orlando’s Fringe, takes place at the much derided theme park (excuse me, tax assessors — it’s a church) at the south end of town, the same theme park whose cotton-candy-haired president turns up to ludicrous effect in another Fringe show this year. But Dockery has much more on his mind than Orlando-bashing (despite the happy uproar from the local audience when he describes “an amusement park where every single day they recreate the crucifixion of Jesus Christ”). And it’s a testament to his regular-guy demeanor, and to a delivery that’s both conversational and charismatic, that his audience enlists eagerly for a journey across continents that takes him, hilariously and provocatively, on a search for honesty, loyalty and faith. Fans of Dockery’s earlier work, Wanderlust and The Bike Trip, know his penchant for travel, as well as his talent for making an outing into a personal odyssey, with all the revelations an odyssey can produce. In The Holy Land Experience, he sets out to do the obvious thing — to compare the theme park to the presumably more authentic Middle Eastern version. But a chance encounter with a Canadian border guard, along with his awareness that he has done a girlfriend wrong, turn the trip into an expedition into his heart and soul. 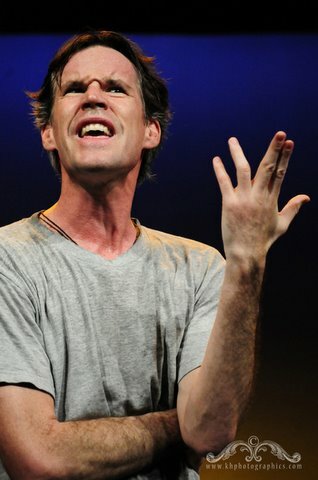 Performing with nothing onstage but a water bottle and a chair, Dockery is all motion: He plunges into his monologue as if he’s already in the middle of the sentence, and the breakneck pace keeps up until his T-shirt is drenched in sweat. He’s the first to set himself up as a guy who’s a little full of himself, a guy who’s willing to take the easy way out (to share a bed, say, with a female stranger), a guy who goes with the flow. But it’s astonishing to see what an agile mind can make of a set of unrelated experiences — a sleepless night with a girlfriend, that encounter with the border guard and one with the guy who plays Jesus at the theme park, who tells Dockery he should submit his resume for the job. And it’s exhilarating to watch Dockery make those connections, to feel as if you, too, had been along on the ride. This kind of theater is church for us non-believers — the place to go for damaged souls to be made whole. Tuesday May 24, 10:45 p.m.
Thursday May 26, 9:05 p.m.
Saturday May 28, 9:20 p.m.
Sunday May 29, 1 p.m.
Martin has been my favorite from day one. I saw his first performance of “Wanderlust.” I knew he had a special talent that Thursday. I knew immediately that Martin Dockery was a magnificent artist. The way he moves his hands, his legs, his hair, even though he has cut it shorter, and his facial expressions could tell a story if he never uttered a word. Can you believe that on Friday, his first shows of the 2011 Fringe were only 40 minutes apart — “Oh, That Wily Snake!” and 40 minutes later, “The Holy Land Experience.” That’s the mark of an artist. Good going, Martin.